Back in 2016, my brother, nephew and I hiked the Chilkoot Trail. People call it “the meanest 33 miles in history,” and I found out why – the hard way. After that adventure, my nephew – just out of the Army – headed back east to start the fall term at Penn State. My brother and I went on to take two canoes “up” the Yukon River – paddling 440 miles in 12 days. Once back home I posted “Naked lady on the Yukon,” on August 28, 2016. (The events of that trip were still fresh in my mind, for one reason or another.) I later posted Chilkoot &^%$# Trail! – Part 1 and Chilkoot &^%$# Trail! – Part 2, on September 7, 2016. The “Chilkoot” starts in Dyea, Alaska. And Dyea is pronounced “DIe-eeee,” maybe prophetically. (Like, “that’s what you feel like doing once you get on the &$%# Trail!”) It ends in Bennett, British Columbia. That’s where you end up waiting, a long afternoon, with other hikers who’ve shared your ordeal. (Of four days or more.) There’s only one train, at 3:15 in the afternoon, so all the footsore hikers get a chance to sit on something besides rocks, and pitch their tents to dry out. Which brings up the fact that the number of hikers is strictly limited; you have to get a special permit to even start. And they keep track of who gets where and when. That’s when I experienced the phantom pack phenomenon. It’s not unlike the “phantom limb” sensation, but leaves you weaving and rolling like a drunken sailor. Another excuse? “Hiking the Chilkoot Trail is sheer torture for someone – like me – with only one good eye and and thus no depth perception.” (For more detail see the February 2017 post, On that nail in my right eye.) So my word of advice: If you have only one good eye and no depth perception, take it slow and easy, and be ready to let the other hikers pass you by. 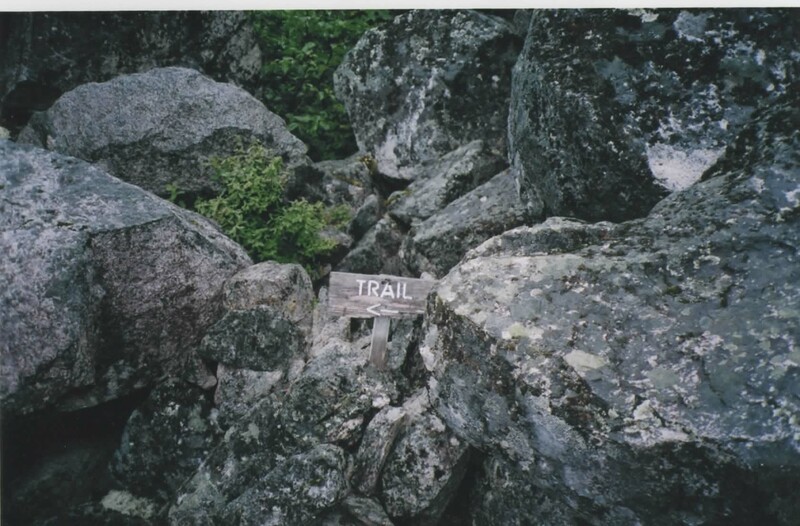 More good advice: Anyone hiking the trail is advised that if they have to get airlifted out – like for a twisted ankle or such – the cost will be a cool $28,000.00. Which brings up another point rangers make in the process of getting your permit to hike the trail: Watch out for the bears! Which in turn brings up the question: Why the hell would you do such a thing? Finally, the book noted that such a pilgrimage – such ritual on the move – can be “one of the most chastening, but also one of the most liberating” of personal experiences. Besides, my Chilkoot Trail experience made the Happy Camp “raisin juice” taste great!!! We endured miserable weather throughout the day – cold, rainy and very windy… At times, especially hiking up to and down from the summit I was quite frightened as I was afraid we would either be blown off the mountain or slip careening down the mountain. I knew the feeling… Also, this review-post borrowed liberally from On the Chilkoot &^%$# Trail! – Part 1 and Chilkoot &^%$# Trail! – Part 2. Re: “Up” the Yukon River. Like the Nile River, the Yukon flows north, which makes it unusual. Re: The negative tone of this post. My brother thought my post “Hola! Buen Camino!” – Revisited was also too negative; too “complaining” in general. So I posted “Buen Camino!” – The Good Parts. But “fun stuff doesn’t make for good drama.” See What Elements Make for [Good Drama]? And BTW: That hike on the Camino de Santiago in Spain took place in the fall of 2017. This entry was posted in Nostalgia reviews, Travelogs on February 6, 2019 by bbj1969per@aol.com.